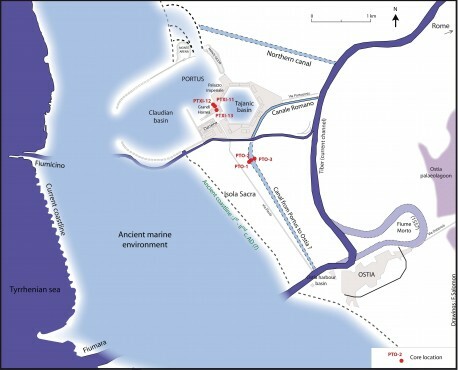 In 2013, geoarchaeological research at Portus continued in order better to understand the configuration of the harbour itself and its connection to Ostia and Rome by waterways. This work was funded by the Research Innovation Fund of the University of Southampton. On July 2013, three cores were drilled in front of the Grandi Horrea di Settimio Severo at the centre of Portus. The main aim of this work was to reconstruct the extension of the basins from the Claudian period to the Trajanic period. More precisely, the aim was to determine (1) if this central part of Portus was originally included in the basin of Claudius and subsequently filled and built-up, or (2) if the basins and the access channel to the Trajanic basin had always been excavated around the edge of this area of the Grandi Horrea. The same hypothesis has been tested elsewhere at Portus: in the Great Horrea of Trajan between the darsena and the access channel to the Trajanic basins (Goiran et al., 2012 ; Bukowiecki and Panzieri, 2013) and near the Palazzo Imperiale, between the Claudian and Trajanic basins (Goiran et al., 2008; Keay and Paroli, 2011; Salomon, 2013). On November 2013, a collaboration between the University of Southampton, French institutions (Centre National de la Recherche Scientifique UMR-5133, and Association Nationale de la Recherche) and the Soprintendenza Speciale per I beni Archeologici di Roma allowed us to drill three cores across a hypothesised huge canal between Portus-Ostia in the Isola Sacra discovered a few years ago by magnetic survey (Keay and Paroli, 2011). Palaeoenvironmental analysis will allow us to investigate the hypothesised canal, in order to reveal its depth and functional characteristics, and potentially also to provide dates for its use. This coring analysis have been complemented by a geophysical survey (Electrical Resistivity Tomography), carried out by Kristian Strutt of the University of Southampton and the geophysicists of the British School at Rome, in order to determine the profile of this feature. Cores have been transported to the University of Southampton and are currently being analysed by myself as part of my postdoctoral research in the Department of Archaeology, as part of the Portus Project directed by Simon Keay. Analyses are taking place in the palaeo-environmental Laboratory in the department of Geography directed by the Prof. Tony Brown. Bukowiecki, E., and C. Panzieri (2013). “Portus.” Chronique des activités archéologiques de l’École française de Rome . doi:10.4000/cefr.935. Goiran, J.-P., F. Salomon, E. Bukowiecki, and G. Boettoc(2012). “Portus.” Chronique des activités archéologiques de l’École française de Rome. http://cefr.revues.org/267. Goiran, J.-P., H. Tronchère, P. Carbonel, F. Salomon, H. Djerbi, C. Ognard, G. Lucas, and U. Colalelli (2008). “Portus, La Question de La Localisation Des Ouvertures Du Port de Claude : Approche Géomorphologique.” Mélanges de l’Ecole Française de Rome Chronique, no. 121–1 ): 217–228. Keay, S., and L. Paroli (2011). Portus and Its Hinterland: Recent Archaeological Research. Archaeological Monographs of the British School at Rome 18. London: British School at Rome. Salomon, F. (2013). “Géoarchéologie du delta du Tibre : Evolution Géomorphologique holocène et contraintes hydrosédimentaires dans le système Ostie – Portus.” PhD Thesis, University Lyon 2, .